Learning to play the guitar has it's ups and downs. One of the ways to continue being encouraged to grow in guitar skills is to continue to balance playing things you have mastered, enjoy and are good at, while also adding some challenging exercises to your daily practice routine. In this next lesson, we will focus on a basic scale exercise to help coordinate the movements of the left hand fingers in synchronization with the right handed picking cadence, timing or rhythm. This exercise will work well for the acoustic guitar, the electric guitar, the bass guitar, or any other size, shape or model of guitar. Be sure to have a decent acoustic guitar before practicing too much, as poor equipment can certainly hinder your growth and increase frustration. Be sure to do plenty of research to find the best entry level acoustic guitar to suite your size, budget and playing preferences before working too hard with inferior equipment. This first set of exercises is good to use as a warm up, and does not represent any specific scale per se. It is also good to use to coordinate the timing and flexibility of the left hand (or chording hand) fingers for future scale playing and dexterity development. The first way to play this scale exercise on the acoustic guitar. Hold the guitar in normal strumming fashion, except that this time, you will focus on only strumming 1 string at a time. This “strum” will actually be more of an exercise to pick out quarter notes, eighth notes or 16th notes depending on the speed you develop and practice (as well as the meter of what you are playing). First, just leave the strings open without chording anything. Place the pick on the 1st string (smallest E string) and count evenly using your foot to tap and keep consistent time, a clock that you can hear tick, or a metronome. Count 1,2,3,4 and repeat this over and over. While counting, each beat represent 1 pick of the string with your plectrum or guitar pick. Pick downward on string 1 on count 1, then pick upward on string 1 on count 2, downward on count 3, upward on count four so that you are alternating the direction of your picking with each beat. Once you are comfortable picking 1-2-3-4 consistently by going down-up-down-up on the first string with your pick, you are ready to begin the chording hand finger exercises to integrate with the picking pattern. Now, stop picking for a minute. Take your chording hand fingers (left for the right handed player) and choose a fret. We'll use the 5th fret for example. Place your index finger (#1) on the 1st string 5th fret, now pick down 1 time with your pick. Next, place finger #2 on the 6th fret first string and pick upward on the string. Next, place your 3rd finger on the 7th fret of the 1st string and pick downward. Finally, place your 4th finger on the 8th fret of the first string and pick upward on the string with the right hand and pick. You have just completed 1 cycle of this exercise, while playing the practice scale ascending. Continue to play this over and over again, focusing on timing and coordination, so that you get a clean sound and so that your timing is consistent. Do not worry about playing this fast. Do it slowly at first to gain coordination between both hands. Gradually increase the speed over the next several weeks until you get more and more comfortable without losing accuracy. Accuracy is more important than speed at this point because practicing sloppy guitar methods will result in sloppy skills. The speed will come with time as your muscle memory improves and your brain learns to coordinate new synchronized movements. Some of the best players in the world started out exactly where you are, and practiced correctly with years of consistency and improvement to become the best acoustic guitar players they could be. 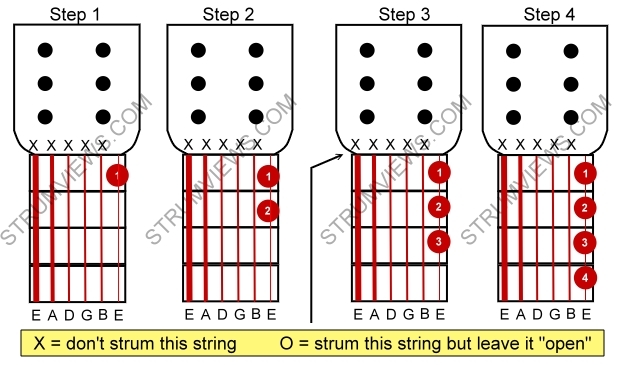 This teaching was provided by strumviews.com. Aaron Schulman has been an avid guitarist, teacher, writer, and composer since 1990, and has developed a site to help people learn how to buy an acoustic guitar by understanding the acoustic guitar construction and craftsmanship more thoroughly. Read more about acoustic guitars and acoustic guitar reviews before making your next purchase at StrumViews.com.